Do you like my crochet heart garland? I’ve been wanting to make one for a while but have always found hearts a bit tricky! I like to try and figure crochet out for myself. I love admiring other people’s work and I will make things from the lovely patterns from my Simply Crochet magazine subscription. But I figure that if I want to sell my crochet makes then they should be a PatternPiper original – including the pattern. 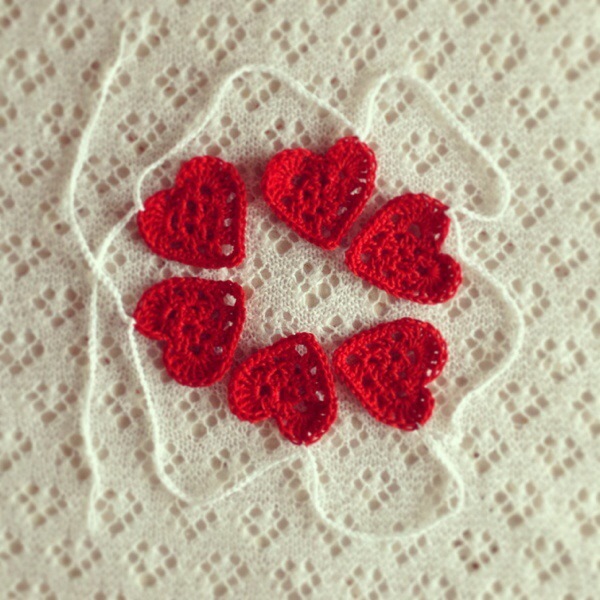 I know that there are similar crochet hearts out there, but I can honestly say that I worked out this dinky little heart pattern all by myself and haven’t referred to any other patterns or tutorials. So, here is my first attempt at writing a tutorial – it’s blumin hard work don’t you know! I’ve probably gone into far too much detail, but I’m a self taught crocheter and I wanted to make sure that my tutorial makes sense to other people. Just because it makes sense to me doesn’t mean it will to everyone! Also, I’ve been offered the opportunity to hold some beginners crochet workshops at Furniture Magpie – a fabulous furniture renovation shop in my local town – so this is a good opportunity to see if I can explain crochet to other people. The lighting in the photos isn’t great and I did want to add symbols to the photos but it would have taken me weeks to get my head round the photo editing software that I have – maybe something to aim for in the future. Also, my laptop is about a million years old and I’m not kidding when I say every photo took at least two minutes to insert into this post – there was a lot of sighing! So for the time being its just over-sized (sometimes under-sized) text and squiggly lines added to the photos. Anyway, listen to me making excuses! 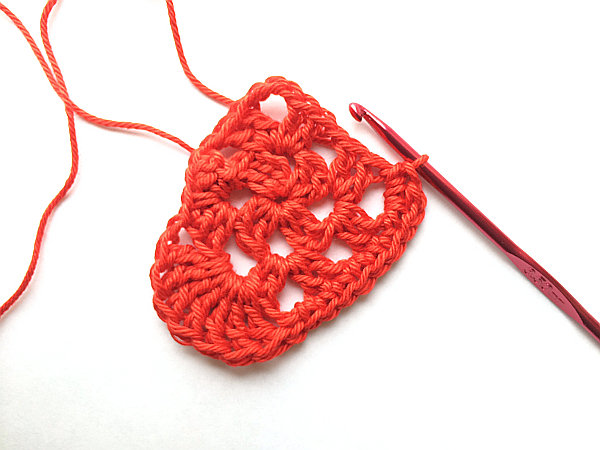 Lets get on with it – the heart in this Crochet Heart Tutorial is made using Patons 100% Cotton DK and a 3.50mm hook. I’ve used UK terms throughout. Foundation Chain – 4 chains, join with a slip stitch into the first chain. 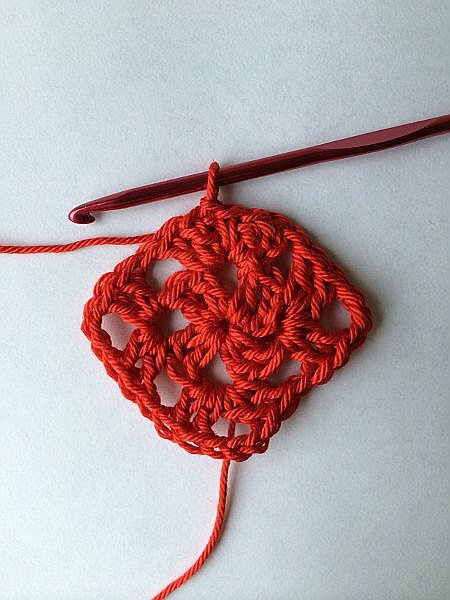 Round 1 – chain 3 (counts as 1 treble crochet). Then work the rest of the stitches into the ring created by joining the foundation chain – 1 treble, 2 chain, 2 treble, 2 chain, 2 treble, 2 chain, 2 treble, 2 chain. Slip stitch into the 3rd chain of the beginning chain 3 to close the round. 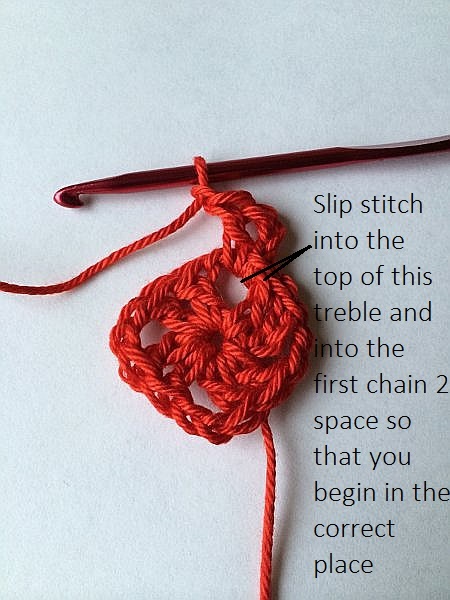 You should have 4 groups of 2 treble crochet and 4 chain 2 spaces. Next, slip stitch into the top of the next treble crochet of Round 1 and into the chain 2 space so that you are beginning Round 2 in the correct place. Round 2 – chain 3 (counts as 1 treble crochet), 1 treble, chain 1, 2 treble in that first chain 2 space of Round 1. Then chain 1. In the next chain 2 space – *2 treble, chain 3, 2 treble, chain 1*. Repeat *-* in the next two chain 2 spaces and then slip stitch into the third chain of the beginning chain 3. 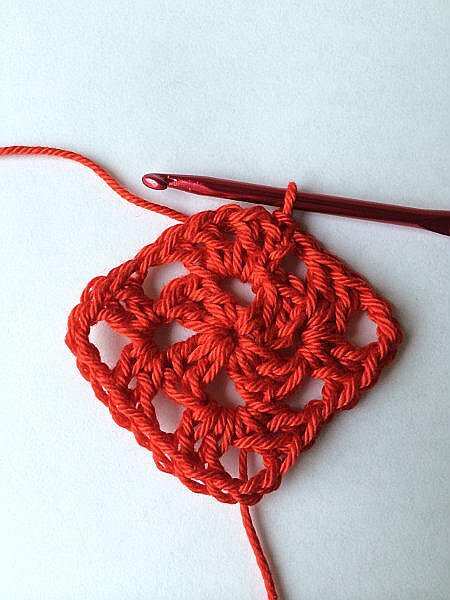 After your double crochet, slip stitch into the top of the next treble. Then, chain 1. The next seven stitches are worked into the next chain 1 space of round 2. Here you need to make 7 double trebles. 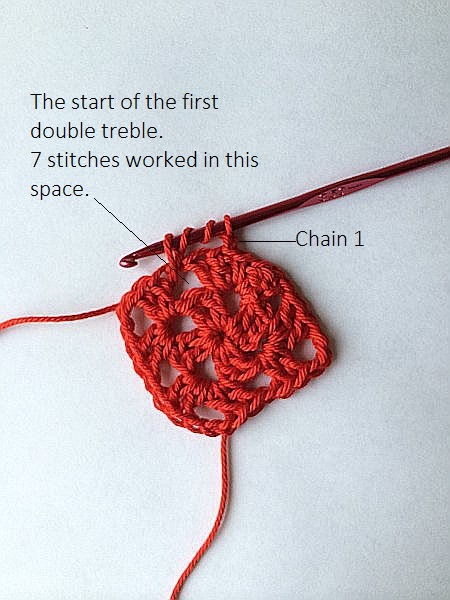 Once you have 7 double trebles, chain 1 and then double crochet into the next chain 3 space of round 2. Next, 1 double crochet in each of the next two treble crochet of round 2. 1 double crochet in the next chain 1 space and 1 double crochet in each of the next two trebles. In the next chain 3 space from round 2 (so, the bottom of the heart) make 1 double crochet, chain 1, 1 half treble crochet, chain 1, 1 double crochet. And then we’re pretty much mirroring what we did on the other side. So, 1 double crochet in each of the next two treble crochets from round 2. 1 double crochet in the next chain 1 space. 1 double crochet in each of the next two treble crochets from round 2. 1 double crochet in the next chain 3 space. Then chain 1. Now make 7 double treble crochets into the final chain 1 space from round 2 and then chain 1. 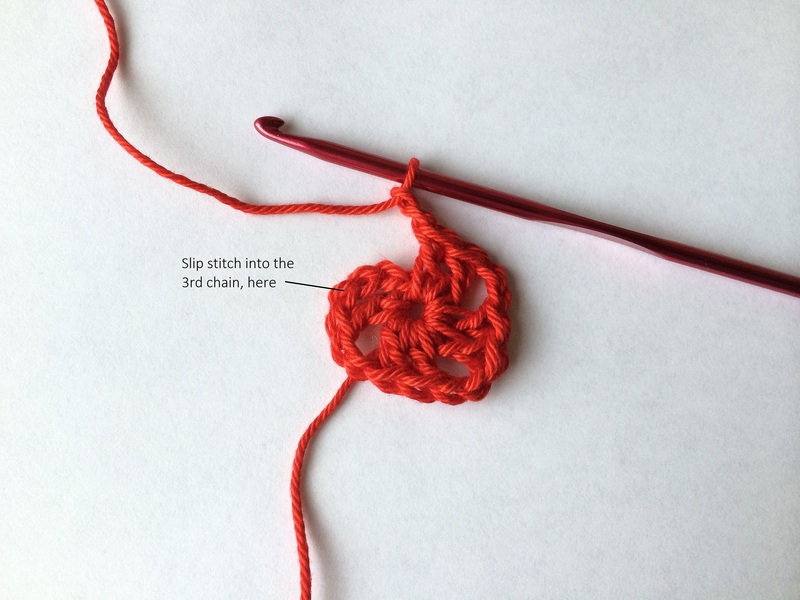 Skip the next treble crochet of round 2 (which is the beginning chain 3 of that round) and slip stitch into the next treble to close the round. Cut the yarn, leaving a nice long tail. 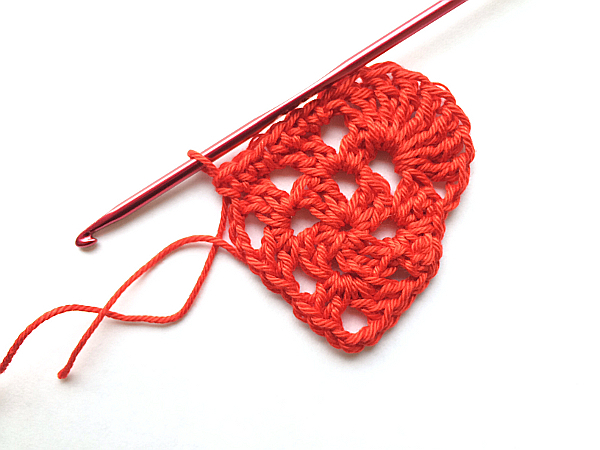 Pull it through to the back of the heart and then weave in the ends with an embroidery needle. Please let me know what you think – have I made any major errors? Is it complete nonsense? 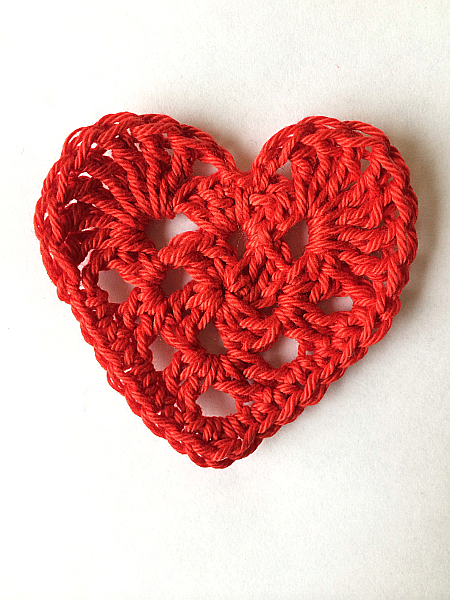 If you’re local you can buy my Crochet Heart Garlands at Furniture Magpie. If you’re not local or can’t get into town you can order by email or pop over to my Etsy shop, they are listed there too! This is a fantastic tutorial!! 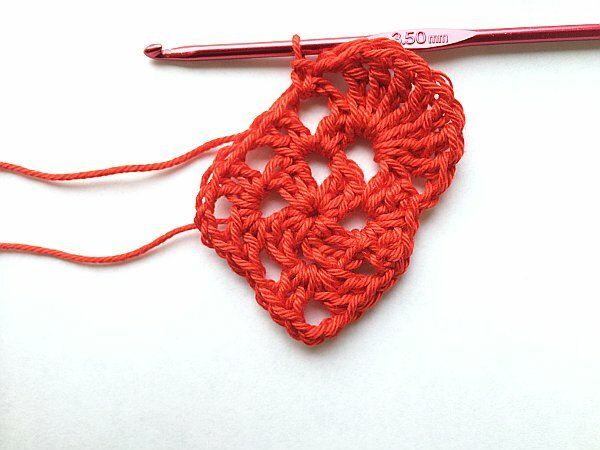 I love finding different patterns for crochet hearts so I’ll definitely be trying this and will let you know when I do. I think the pictures are really clear. If you haven’t got to grips with photoshop software yet, you could always try Pic Monkey. It’s a free web based editor where you can brighten and crop etc. Congrats on the crochet teaching too! Great tutorial!! I look forward to making a lot of these little hearts soon! Thank you – very lovely of you to comment. 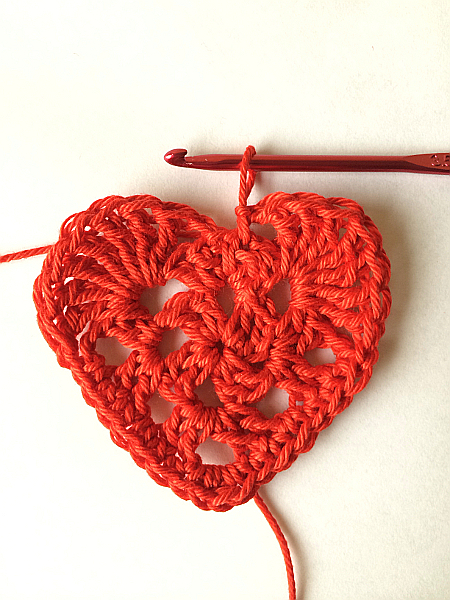 I hope you enjoy making the hearts – they are a but addictive! To be honest, as a person who is home taught, can only do the same pattern to make a blanket, and has never read anything about crochet in my life, I wasn’t sure what all the chain, trebles and slip stitches were all about, but I could follow the pictures and think i’m starting to understand the language as a result! Cheers PP. Thanks for your comment Anna. I’m glad you like the pattern. Do let me know how you get on. Thanks for putting this tutorial up on your blog! It was easy to follow and I only messed up once ( totally my fault for not reading the instructions properly!! ). 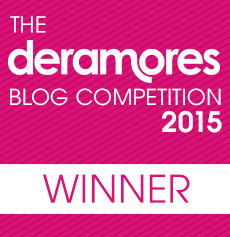 A piccy will be on it’s way!! This looks beautiful – I will definately be trying this once my little boy is in school tomorrow. Thank you for the brilliant tutorial. 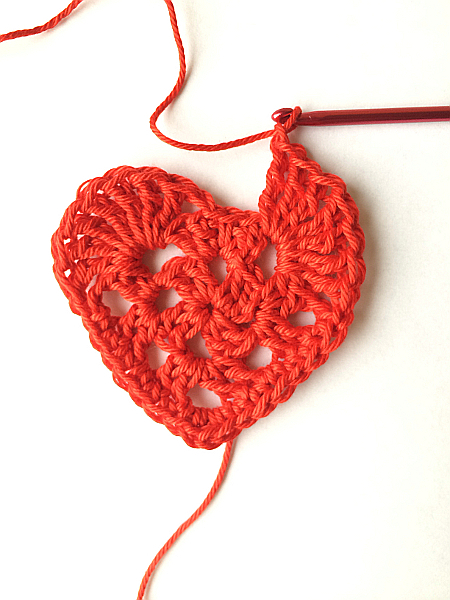 PatternPiper published the sweetest crochet heart tutorial on her blog. It’s the perfect Valentines Day project. Don’t forget that I am giving 14% off on pink, red and white yarn in my Etsy shop with the code 14LOVE. 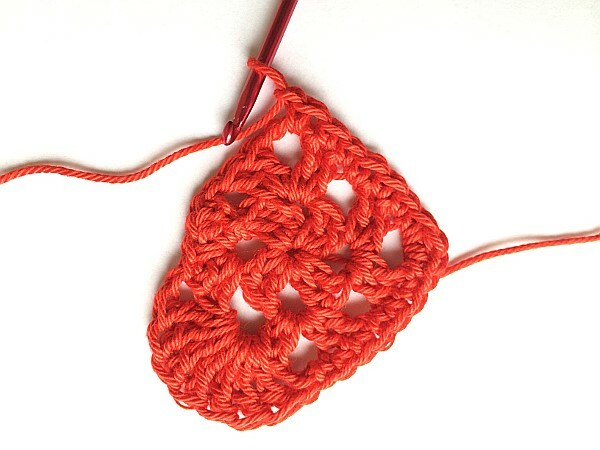 I adore your hearts, they have a granny square look about them, and I do love gannies. 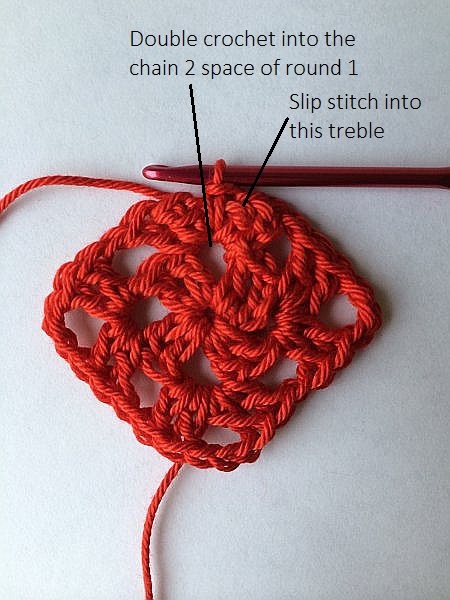 I am definatley going to give this a try, I am not very good at following patterns but your tutorial looks fabulous and easy to follow. Thank you. It was great to follow your tutorial and all was very clear. The result is very nice. I’ll try to send a photo tomorrow. Thanks a lot. Beatrix , a reader from France. Thank you Beatrix for taking the time to comment. It is very exciting for me to know that people in different countries like my tutorial. I would love to see a picture of your finished heart – thank you. These hearts are adorable! There are so many heart patterns out there, and I love that this doesn’t result in a heart that looks exactly like all the others. Thank you for sharing! Thanks! So pleased you like it. Let me know how you get on. All of the photos on this blog are my own unless I've stated otherwise. I will always credit and link to the owner of photos, patterns and tutorials that are not my own. If you'd like to use any of my photos, patterns or tutorials please credit me and link back to the original blogpost - I promise to do the same for you.